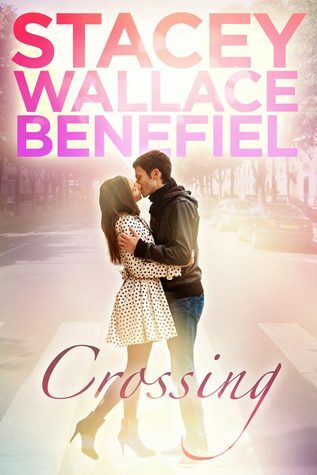 Book Review: Crossing by Stacey Wallace Benefiel - Book.Blog.Bake. So far, I have been wildly unimpressed with new adult books as a genre. I think it has potential, but I haven’t seen it. So when I saw this book with the stunning cover on Netgalley and I read reviews that said this wasn’t your typical New Adult book, I decided to branch out of my comfort zone and read it. And while I do agree that Crossing manages to duck some of the more troublesome trends in New Adult literature, it still plays into quite a few of them. Dani is quite an interesting character. I can’t say that I LIKE her necessarily, but I’m interested in her actions and I’m at least drawn to her as a narrator. She’s loud and a bit obnoxious at times, but at least she’s not the stereotypical quiet, shy girl, so thumbs up there. Liam also gets an A- as a character, since he’s actually pretty endearing and not a jerk. Him and Dani have their misunderstandings and they both have less-than-stellar behavior at times, but as a couple, they treat each other pretty well, which is refreshing to see. Their relationship happens pretty quickly, so I’m not sure I buy it 100%, but at least they ACT like a normal couple towards each other. Crossing also tackles some pretty heavy issues, especially towards the end. I won’t give anything away for fear of spoilers, but let’s say I was happy with how these issues were dealt with. Things weren’t perfect, but Dani handled things like a real person might, and the book tended to not be too dark nor too light(it’s not as light as the cover or the synopsis suggest, actually). At this point, Crossing would be a solid 3 stars. Except(you knew it was coming), there are some things I just can’t ignore. Having just been a college student, Dani and Liam do not act like any college students I know. In fact they, and there friends, act older. I don’t find this “new” adult, because besides the fact they’re in college, they’re acting pretty much like adults. And that’s not to say that college students aren’t mature(because I’d like to think most of us are), but college is quite transitional and I saw none of that here. Dani and Liam go out and party all the time, never have to do work, and never seem to have the typical college woes. At the beginning of the book, there’s a note that says Crossing was in part based on a true story, so perhaps this excessive life is some people’s college experience, but I never saw anyone have it to quite this extent. By all means, new adult books, show the parties and the dating culture and college culture because it is real, but be realistic. Besides theater rehearsals, Dani never seems to have class or have to work on assignments, and I just don’t understand this portrayal. And as I said before, college is a time of transition as well. And Dani and Liam are older college students, so I don’t expect them to be homesick, but I just expect a little more. . . questioning of themselves, I suppose. I’m not sure how to word it, but I just know that in college my roommates and friends and I had a lot of late night conversations about who we were, what we wanted to do, and how we’d fit into the world, and I don’t think this is something that was unique to us. And this happens a little bit, mainly with Liam, but it still just feels off to me. I don’t expect every college experience to be the same, but all the New Adult I’ve seen, read, and heard about has been an experience cut from the same cloth, and it’d be nice to see some variety. Final Impression: Crossing manages to avoid some of the biggest downfalls, but unfortunately still gets stuck in a few areas. The portrayal of college experience seemed off to me, but I did enjoy Dani’s character. While I think Crossing is an example of some good steps to take in the New Adult genre, I don’t think it’s there yet. 2/5 cupcakes. Right. And I’m not AGAINST that greater degree of independence and it’s consequences, because that IS true for some college students. But I don’t want that to be ALL NA is. I want some REAL conversations, some REAL discovery, and yes, some REAL struggles. I’ve had very similar experiences with my limited foray into the “new adult” genre, and most reviews I’ve seen have said the same. The only “new adult” book I’ve read that does the genre justice is Lauren Graham’s Someday, Someday, Maybe. Franny’s internal monologue annoyed me a bit, but the novel deals with issues 20-year olds are facing in a realistic way.